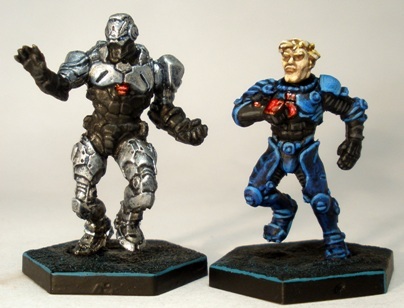 I finally finished my first Dreadball team, the OCP Patriots, a genetically pure human team. The “Jack” position, front and back. These guys took me longer to paint than I intended. I made a plan for the colour scheme, but didnt quite stick to it. It had a knock on effect on other colours that increased the time taken to paint the team by a factor of two or three I reckon. I dont think that the extra effort that I had to put in shows either, it was all damage control rather than artistic inspiration. The team looks OK all the same, and so far the Patriots have been good fun to play using, so thats something at least. The human team features three player positions, Strikers, Guards and Jacks (the linemen or midfielders). Guards are not allowed to handle to ball, so they dont feature the jazzed up “Dreadball Glove” featured on the Jacks and Strikers (visible on #1 above). All of the models that are allowed to handle the ball have had magnets inserted in their bases that correspond with the balls shown earlier. OCP “Guard”, front and back. The guards are my favourite models on the team. I particularly like the shoulder and leg armour. The Enforcer and Lucky Logan. 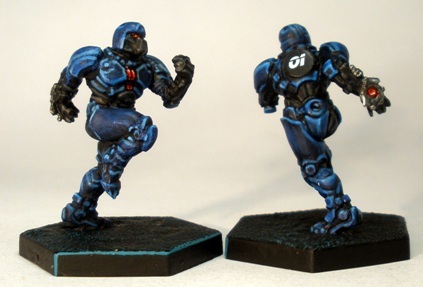 Although not strictly part of the Patriots team, I painted up the two MVP figures above to fit in with them. With a name reminiscent of actors in adult movies, Lucky Logan only plays for human teams. It therefore made sense to paint him in a matching team strip. Luckys eyes are extremely squinted, so much so that I decided to just darken the sockets rather than paint the eyes in. 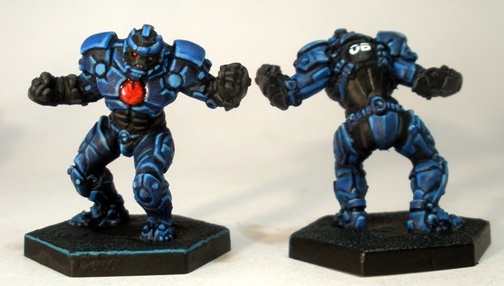 The Dreadball range is smaller than the industry standard, which made the prospect of painting his eyes even more daunting, so I gave it a skip. It wont ever be seen during a game anyway. With a team sponsored by the evil corporation in the movie Robocop it made sense to me to paint up the Enforcer to look like the titular character. The detail was a little soft on this figure, which made painting it take longer than I expected it would. The end result is ok, but it could be better. The next team that I am working on is my B.P. Oilers. Hopefully they wont take me as long to get finished as the Patriots did. EDIT: after painting the Oilers I went back and rebased the Patriots slightly to make the threat zone markings more prominent, so I took another updated photo. I think that the extra work on the bases paid off. It makes the team look more finished somehow. “B.P. Oilers” … nice. I assume they’re Veer-myn? Man-sized rodents seems appropriate for them. The Patriots are looking good. The red sets them off nicely, and I like the style on the numbers. The red on the Patriots was an effort to brighten up the scheme a bit after a previous plan went by the wayside. The red is gloss varnished and stands out a little more in person, but it works adequately. They look a little like cops due to the palette I reckon. 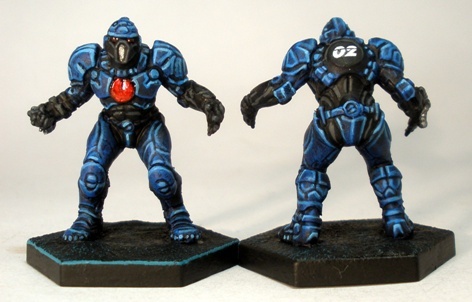 The numbers are from the standard Dreadball transfer sheet. The font used plus the splash of white really help to finish off the team. The Oilers are marauders, so orx & goblins. The green of their skin will hopefully work with the planned yellow/gold uniforms to be reminiscent of the B.P. logo. The name is a bit of a cheap gag (and a slightly depressing and nihilistic one really) but y’know, Im going with it this time.